My dog Jack was the same way when we first adopted him. A lot has to do with how often a dog gets walked. If they only get one walk a day, if that, how can we expect anything less? If you feel this is the case, I hope you will find a way to take her out at least twice a day, but 3 times is better. Please don’t yell or punish her for her over exuberance!! Okay, let’s look at how we can start the walk off on a much calmer note. The simple rule is – the leash does not go on until Josie is sitting calmly, and every person who walks her must follow this rule. If for some reason it’s too hard for her to sit, have her stand/stay – that works too. Call her over to the spot where you get her ready for her walk, and ask her to sit. As soon as she starts jumping around drop the leash, turn your back and don’t say a word. When she’s quiet for a few seconds pick up the leash and clip it on. If she starts jumping again drop the leash, turn around, wait for her to calm down before trying to attach the leash again. It can be frustrating, I’ve been through it myself, but you’ll be surprised how quickly she will learn – when she’s calm she gets her walk. I’m a big believer in training with treats, but not in this case because the longed for walk is the reward. 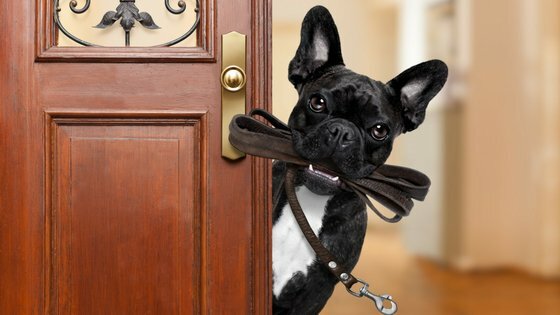 Great tips on how to train the dog to accept the leash. This is one of the most important things that pet parents need to learn. In my experience it is all about patience and repetition. Thank you Adriana. I agree it’s about patience and repetition, yet too many people have neither! Yes, absolutely. Dogs do what works or, what they think works. They will stop doing something that is not working. The problem is, understandable though it may be, people don’t have enough patience to stick with the training. This is the part of dog training that takes a little more human training. Patience and staying strong are key! So true Joelle, it’s the people who need the training! Perfect advice! Phoebe gets super excited before walks if I haven’t walked her every day. I make her sit to put on her harness. If she gets too excited & gets up & starts jumping I stop until she sits again. Sometimes it’s hard for her but she’s learned she must sit calmly or we go nowhere. I never get frustrated, she would pick up on that & get stressed. Thanks Cathy. I imagine it must be hard for Phoebe to sit still when she can’t wait to go out, she’s smart to realise the faster she stays still the faster she gets to go! Mr. N has zoomies after I put his leash on him but not before usually! He knows a “wait” cue so if he’s a little antsy, I use it when I put his leash on him. It’s hard not to get excited about being out there in the world. Jack is great with “wait” the best cue he knows. As with many things when asking a dog to do something you would prefer them to do, it takes time and patience. Some dogs pick up very quickly what you require of them, others take a little longer, consistency is key. Great tips, it’s not difficult to do, but some people give up at the first hurdle! You’re so right Michelle, training is not difficult at all it just requires time and patience which is why too many give up too easily. Shame for the dog and the family. My mom used to have a problem getting a leash on her dog, but she’s tried some of the tips you mentioned and he is much better. He loves to go outside with my parents. Glad to hear it, I’m sure walk time is more pleasant for everyone. My current challenge is getting a harness on the 1.5 pounder. Who is NOT impressed with the it. It’s such a battle! I have a reactive dog so if you fuss with him too long he doesn’t like it, yet surprisingly getting a harness on is easy. I don’t know what kind you use but I find the step through harnesses are the easiest to get on. 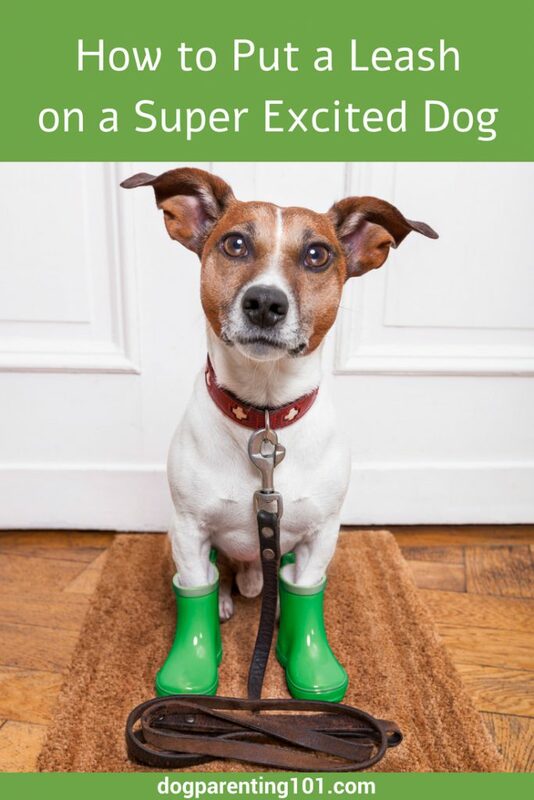 You just open it up, lay it flat on the floor, get your dog to step in the 2 holes and clip it closed. Takes a second. Good tip! I usually make my dog sit at the gate (when I had a crazy, excited one – Buffy is too laid back). Sitting makes them weight and they can’t get out the gate until they sit.